Available with the 60Hz Radian A Series 4kW or 8kW inverter/charger, each model incorporates OutBack’s GridZero technology, a superior level of intelligence in energy management for self-generation and self-consumption programs. It provides precise balancing between using stored energy, solar and utility power, blending-in the latter to overcome surges and load spikes. All models feature an Advanced Battery Charging (ABC) profile option to support leading-edge battery technologies such as lithium-ion and others, and enhanced diagnostics for improved performance. • The 4kW FLEXpower Radian (FPR- 4048A-300VDC) is ideal for smaller power applications—including homes, cabins, remote communication sites and backup power systems. GFDI protection comes built into the FLEXmax 100 charge controllers. • The 8kW FLEXpower Radian (FPR-8048A-300VDC) is ideal for applications with medium-sized power requirements—including larger homes and light commercial or backup power systems. 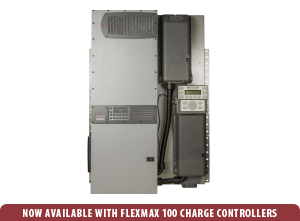 GFDI protection comes built into the FLEXmax 100 charge controllers.